When you’re working in the hip hop genre and you don’t quite fit the standard image, however, misconceptions are very much part of the landscape. 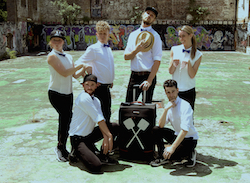 The Sydney-based six-piece Phly Crew is not only used to this but is also conscious of the fact that what the group does (which is to blend dance with comedy and theatre sport) has created a niche in the market which it plans to fully exploit. Phly Crew. Photo courtesy of Phly Crew. If this sounds more like family-friendly variety, well, that’s because it is. Phly’s dancers have serious formal training in contemporary, jazz and even ballet. 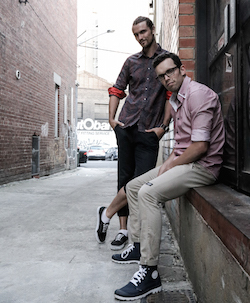 Their shows contain scripted segues and aim for the comic and theatrical. Phly Crew Artistic Director James Barry and Manager Neale Whittaker. Photo by Kidd Suave Photography. With crowdfunds behind them, Barry and Phly Crew are now ready to break into 2016 with a high profile showcase event (and a hand-picked guest list of industry players), all of which is part of a longer term plan to counter the ever-present age ceiling that hangs over every dancer. “We want this to be a company because if we get to the point where our bodies don’t want to dance anymore, we can tell younger people to do the thing,” Barry adds. 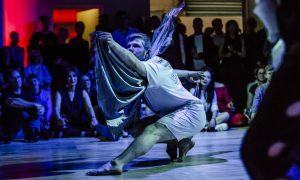 To see Phly Crew at NIDA this month, visit www.nida.edu.au/events/music/phly-crew-2.0.